Me and my girlfriend of 4 years love food. 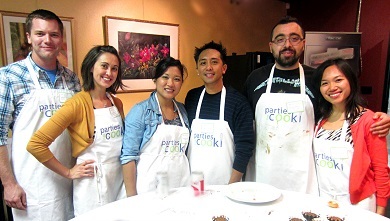 I wanted to propose at one of your Bay Area cooking classes, but I just read that it has already been done. Regardless, I’d like to see if we can make that special moment happen. Thank you for your time, and I look forward to your response. I manage our public cooking classes, and the moment I saw this request, I knew who to turn to. 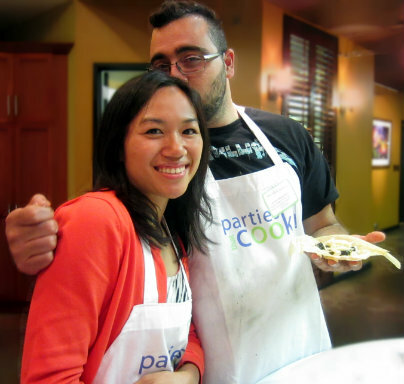 Our Executive Chef, Tanya, was heavily involved in our last Date Night proposal — she loves this stuff! Tanya came up with a game plan for this surprise proposal, and everything was set. Fast-forward to July 19, the morning of the big event. I received an email from a different Date Night attendee that read, “My girlfriend doesn’t know I am going to propose to her…”. I nearly had a heart attack! Before I could collect myself enough to continue reading, I was overwhelmed with anxiety. We couldn’t pull off two proposals on the same night! Luckily my overly dramatic panic attack was short-lived. The very next sentence clarified that he would NOT be proposing that night. This guest would be filming the class, collecting video for his own elaborate proposal project. Whew! That evening, Chef Tanya needed time to set the scene. She told Roswell to stall his girlfriend and come to class late. Before the pair showed up, Tanya recruited two fantastic volunteers to serve as decoys and help dupe Roswell’s gal. All other guests were kept in the dark (sorry, guys!). When our target couple arrived, Tanya could tell Roswell was nervous and his unsuspecting girlfriend was less than pleased they were late. Obviously a little confused, the guests needed a little prodding by Tanya before they turned away from “the action”. Roswell took his cue, and got down on one knee. Success! His now-fiance said YES and everyone cheered. We are so happy to have been involved in this special moment, and hope all our guests remember that night forever. I know we will! Taking on the task of cooking for your Valentine? Well, you should! 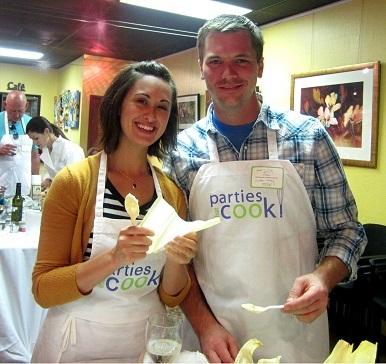 Cooking for your date shows you put thought and effort into the evening. Even if you’re planning an elegant dinner out this Valentine’s Day, you can put a personal touch on the night by baking your own dessert. This easy to make Scharffen Berger Chocolate Soufflé Cake with Salted Crème Caramel – the name alone sounds deceptively intimidating – is sure to impress! This recipe, along with other crave-worthy recipes, can be found in our Dessert Recipe Library! 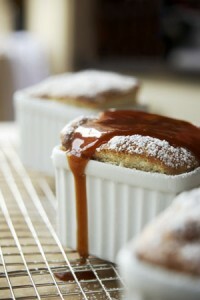 Preheat the oven to 275º F.
Prepare cake pans: Butter bottom of 8 5-ounce ramekins. Dust the sides of the ramekins with granulated sugar and tap out the excess sugar. Batter: Melt chocolate and butter in a bowl or double boiler set over lightly simmering water. Once melted, stir to mix and remove from heat and let cool slightly. Separate eggs placing yolks in large bowl and whites in medium bowl. Using a hand mixer, whisk sugar and vanilla into egg yolks until they are thick and pale. Gently (on a lower speed) whisk cooled chocolate mixture into egg yolks. Whip egg whites to soft peaks and fold them into egg yolk/chocolate mixture. Bake Cakes: Pour batter into the prepared ramekins and bake until raised and just set, about 20-25 minutes. Remove and place on cooling rack. Make Crème Caramel: Combine sugar, water and cream of tartar in a small saucepan. DO NOT STIR. Bring to a boil and cook until the caramel browns. When the caramel is medium brown, stir in fleur de sel and remove from heat. Carefully add cream and simmer until ready to use. Serve: Pour about 2 Tablespoons of caramel on the plate and swirl plate to coat. Invert cakes from ramekins onto plates and sprinkle with a touch more fleur de sel if desired. Garnish with mint. 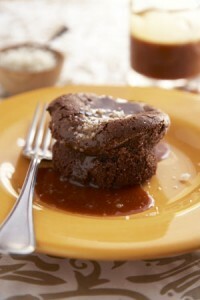 Quick tip: Serving your Chocolate Soufflè warm will melt your date like putty (or salted crème caramel) in your hands. Just saying.